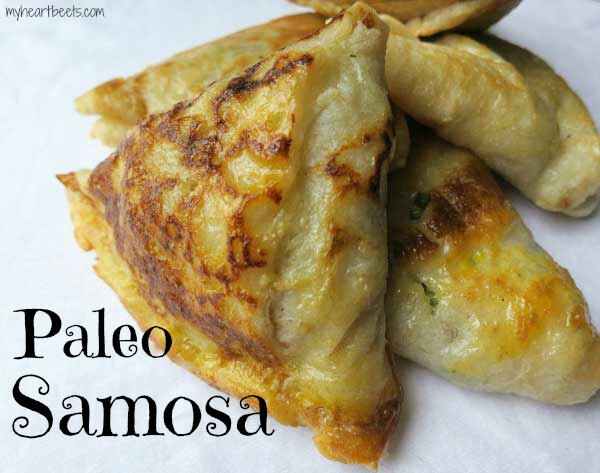 When you decided to go on the paleo diet, did you think you were saying goodbye to samosas forever? Well, guess what. It’s time to say hello again. Why, hello samosa. Oh, excuse me. Why, hello paleo samosa. Aren’t they beautiful? So crispy and golden and… triangular. These savory little pockets of dough are filled with a traditional spicy mixture of potatoes and peas. (If you don’t eat white potatoes, use sweet potatoes instead. If you don’t eat peas, you can leave them out). 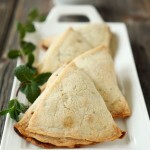 These paleo samosas are so easy to make. In fact, they’re easier to make than regular samosas. 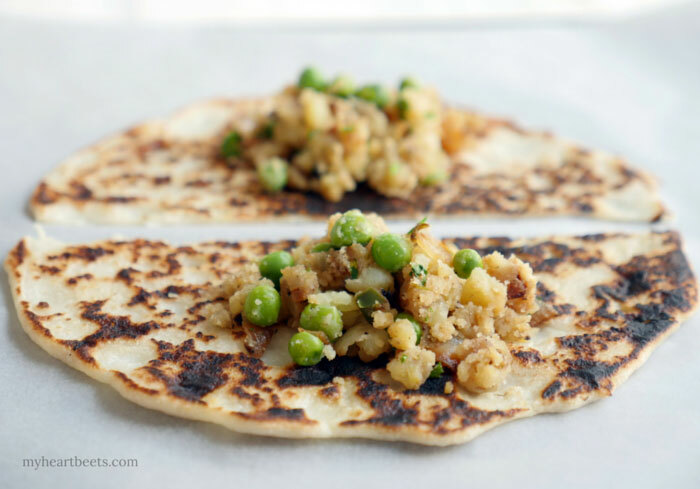 If you can make my 3-ingredient paleo naan, then I assure you, you can make this. That’s because these samosas are made with the same naan batter. It turns out that when you bake paleo naan – it turns into something crispy and flaky and oh so tasty. To make these samosas, first make the paleo naan batter by combining tapioca flour, almond flour and canned coconut milk. Then make 2-3 naans (depending on how large you want your samosas). Let your naan cook long enough so that you can easily move the flat bread from your frying pan onto a baking sheet. The bread will still look a little raw, but don’t worry – it will finish cooking in the oven. Once you have your naan on a baking sheet, cut it in half. Then add a spoonful of your filling in the middle. Next, fold one side of your bread over the filling and then fold the other flap – creating a triangle. Pinch the bottom closed. You can use egg wash to help keep the edges sealed; I also suggest brushing egg wash on top to help you achieve a pretty golden crust. If you don’t eat egg, use ghee or another oil instead. Bake the paleo samosas for 30-40 minutes or until crispy. If you need to flip the samosa over, do so (I didn’t). You can also try frying these – I’m sure they’ll be delicious. Have you ever had something fried that wasn’t delicious? Exactly. I just think baking is easier. If/when I fry them, I’ll update this post to let you know how it goes. Add whatever filling you’d like to these lovely samosas. 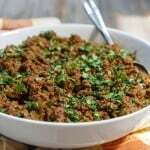 If you prefer meat – then use my Ground Meat Samosa Filling! You can also try making my incredible paleo empanadas. 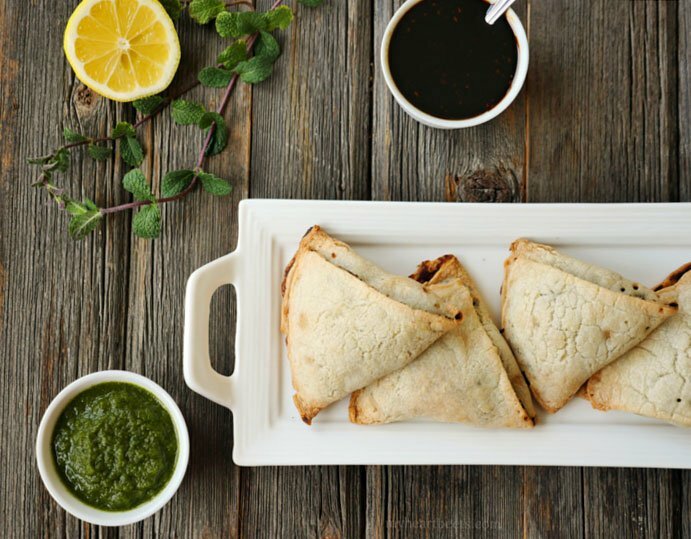 Eat these samosas with my sweet and spicy green chutney while sipping on some masala chai. Ahhhhh. This reminds me of my life before paleo – only now, I feel awesome after eating one or two (or six) of these incredibly delicious treats. Like Indian food? 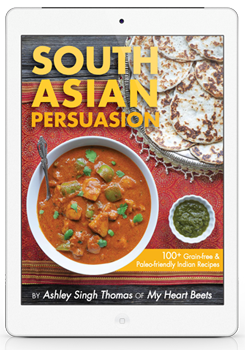 Then be sure to check out my Paleo Indian eCookbook: South Asian Persuasion! 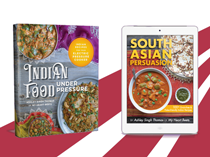 It has 100+ Paleo Indian Recipes, many of which you won’t find anywhere else (pakoras, vadas, paneer, chaat and lots more)! In a bowl, combine samosa crust ingredients to form a batter. Pour a third of the batter onto a frying pan and cook until the bottom firms slightly, then remove and place on a baking sheet. Cut the naan/pancake in half and spoon the filling mixture in the middle of each piece (see pictures above). Fold one side of bread over the filling and then fold the other flap over – making a cone or triangular shape. Pinch the bottom closed. Boil potatoes and peas (boil them separately) and set aside when done. In a saute pan on medium heat, add ghee and cumin seeds. Once the cumin seeds turn golden, add green chilies, onions and a pinch of salt – stir-fry until onions turn translucent. Then add ginger, spices and stir-fry for a minute or so before adding the mashed potatoes – combine well. Fold in peas and cilantro then set the mixture aside until you’re ready for it. wow, yet another recipe i can’t wait to make!! (and triangular foods are my favorite!) thanks! Thanks so much for the recipe! I am a new reader and just tried your paleo naan last night. My boyfriend and I loved it! 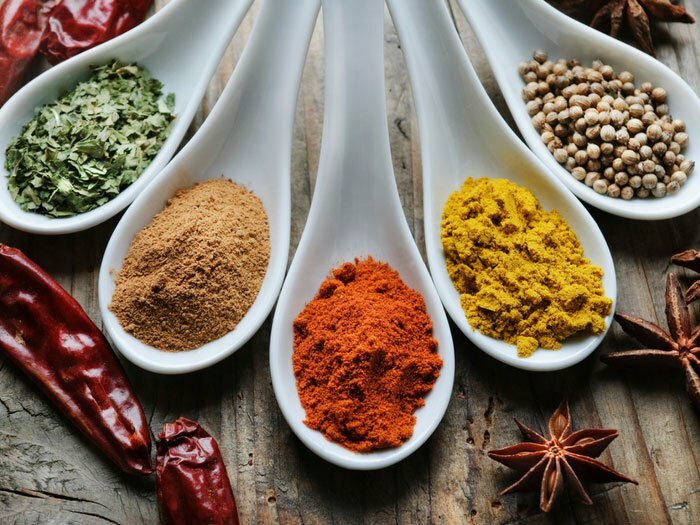 I am excited to try your other Indian recipes, as we love Indian food but can’t eat gluten or dairy. Thanks again! Oh wow. I can’t wait to try this. I’ve been missing samosas so much and this is something I can totally make. This makes me crazy happy! Hi I was wondering if you had any ideas of what we could stuff these with so that they could be made into a sweet treat. 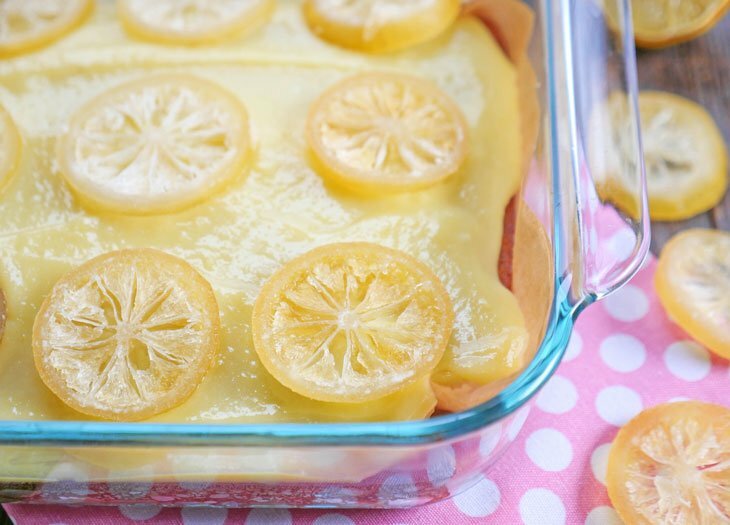 How would I go about using fruit or a pie feeling that is paleo, my partner is having a really hard time with no sweets and we keep going over for custards, which leave both of us feeling like poop. Hi Joe! You should be able to stuff these samosas with anything: chopped dates, raisins, pistachios and honey, dairy-free chocolate chips, jam, fresh fruit – whatever filling you’d like. Just put the filling in the center and fold. 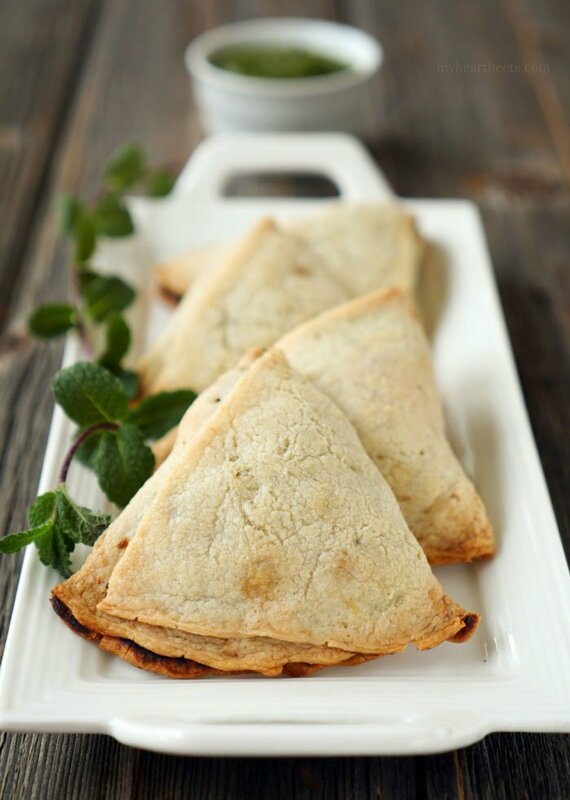 You can also try making a dessert empanada – it may be easier than folding the samosa: https://myheartbeets.com/paleo-empanada/ Please let me know if this helps you and let me know what you decide to make! 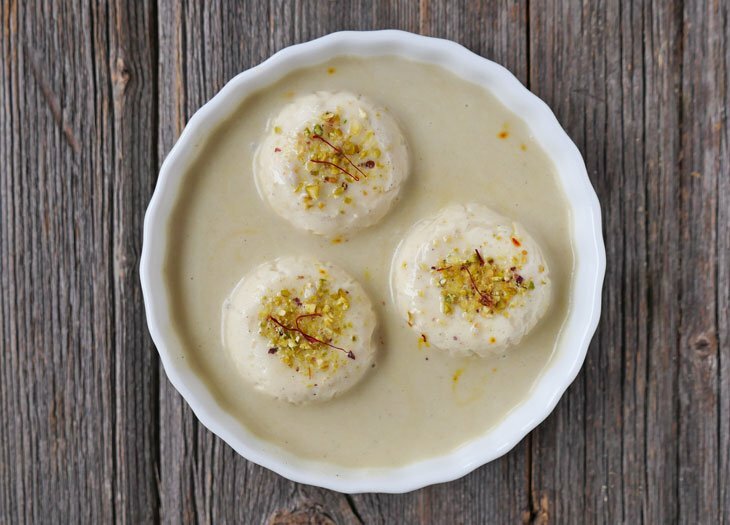 If you’re looking for other dessert ideas, search my site for spaghetti squash kheer and carrot fudge. I TOTALLY want to make these but hubby has a nut allergy and we aren’t brave enough to test out almond flour to see if he can tolerate it. Do you have any suggestions for a good almond flour substitute as I see most paleo baked foods have almond flour in it? Hi Aimee! 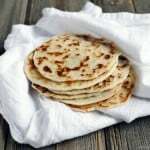 I am currently working on a nut-free naan recipe and once I make a couple tweaks, I will try to make my paleo samosa and paleo empanadas with it. Have you subscribed to my newsletter? I’ll send out an update once I do all of this. Do you think arrowroot would work in place of tapioca? These look just awesome! I’m going to try them with a bit of ground meat added to the base (I love the beef and lamb samosas at this local samosa shop in N-E Toronto)… Any thoughts on making some kind of dipping sauce? Your paleo naan was just awesome, btw. Perfect with shwarma chicken and zucchini hummus…. My son had nut allergies. I’d love to try this but cannot use any kind of nut flour. What would be a good substitute? Hi Tamie! 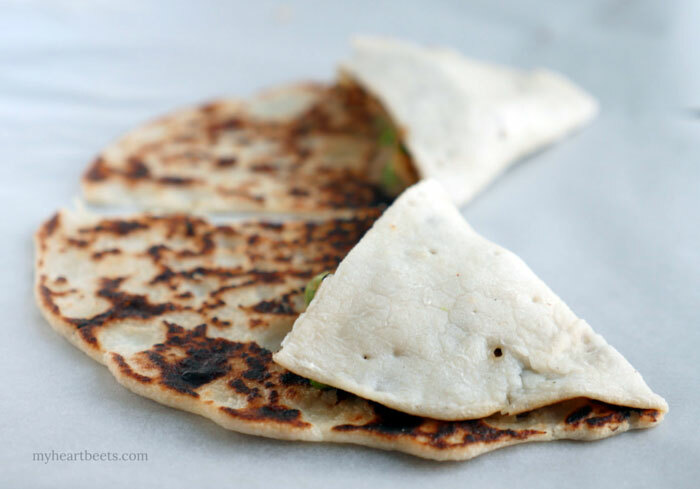 Have you seen my paleo roti recipe yet? It’s very similar to the naan but without nut flour. I haven’t tried using the roti bread to make my samosas/empanadas yet but I think it should work. If you try, please let me know how it turns out for you. I signed up for your emails and can’t wait til you find a great substitute for the Almond flour so I can make these for my kids to take to school!! 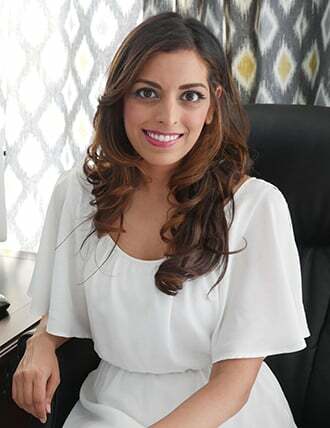 Did you see my paleo roti recipe? It’s very similar to the naan but without nuts! I haven’t tried using it to make empanadas or samosas yet but I’m hopeful it will work! If you try it before I do, please let me know! Hi! I was wondering if you’ve ever frozen your naan or recipes with naan -like the samosas. I’m curious if I make them and freeze them, will they thaw and bake well? Thanks! Ashley, I LOVE THESE!!!! Thank you so much for this recipe! I made another paleo pancake recipe tonight and it just fell apart. Yours is FANTASTIC! I can’t thank you enough. These are SO GOOD!!! I am going to tweet about you. I added cooked quinoa and sauteed spinach and mushrooms to the filling. I also added sharp cheddar to the filling to one of the samosas. It is ALL so good! Thank you for a delicious start to my new year. 🙂 Thanks again for sharing. One more note, I found mashed sweet potatoes in the freezer at Trader Joe’s. It makes it so easy to use them for this recipe. Hi Susan! 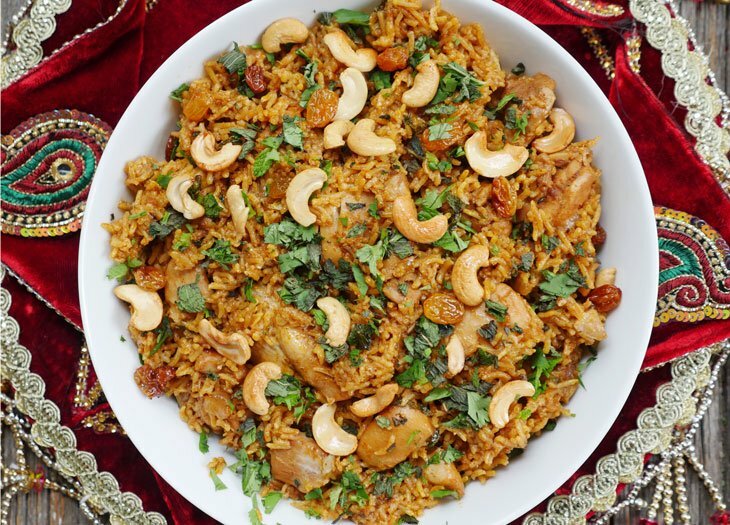 I’m SO glad you love the recipe – thank you so much for the comment!! And, I totally appreciate you tweeting about me 🙂 All of those fillings sound absolutely delicious – I will have to look for the mashed sweet potatoes. 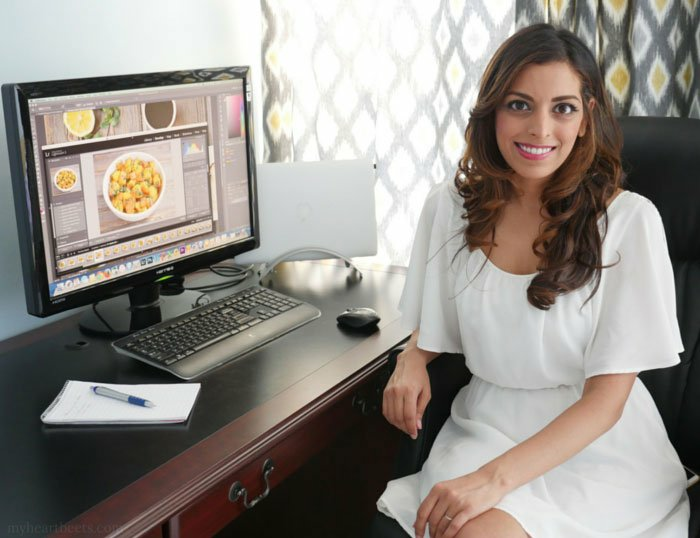 I hope you’ll let me know if you try any other recipes on my blog! The dishes look so delicious, I can hardly wait for tomorrow. Thanks, Peg 🙂 Let me know what you think of the recipe! Hi Ashley, thanks for the comment! Happy to hear you love Indian food 🙂 I hope you like the gluten-free naan recipe as well as this samosa recipe. Let me know how it turns out for you! Carmela, so happy you liked the recipe! Hi Christine! 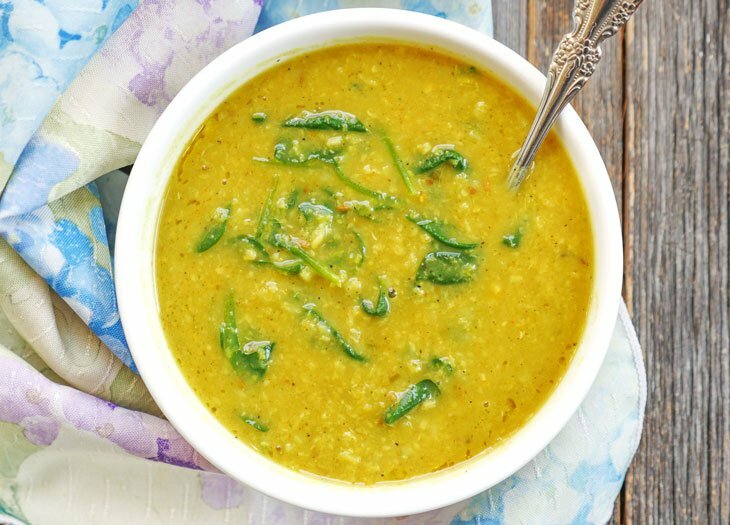 Have you tried green chutney before? It’s great with these samosas: https://myheartbeets.com/green-chutney/ You can also use ketchup 🙂 I have a tamarind chutney recipe that I need post soon too… so stay tuned! I have been craving some good Indian food. I was able to be fortunate enough to be in Kerala for a few weeks a few years ago and fell in love with their food and their flaky delicious parathas. I found an awesome Indian market today that had frozen samosas and parathas and that made me crave some. 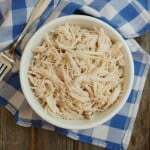 I found your recipe on Google and have used some of your recipes in the past and was so very happy to find these! I can not wait to try these! Thanks for coming up with these paleo versions of these wonderful recipes and sharing them. 🙂 I really need to subscribe to your site! Hope you have a wonderful day! I am so ecstatic I think I am going to have a stroke!!! These are AMAZING! Even my staunch counter-Paleo husband loved them! We are massive Indian lovers and I thought my time in the sun was over. Weeeeeee! The naan was delectable as well. The only thing I changed was I used cubed turnip and celeriac instead of potato as I’m trying to limit carbs, tapioca not being exactly low carb, but still lower due to its light weight than wheat flour. Happy, happy, joy, joy! You deserve a Nobel prize!!!!! Jac, thank you for the sweet comment! I’m so glad that this recipe turned out well for you 🙂 Hope you’ll let me know if you try any others! Do you use pidgeon peas for this recipe? I absolutely cannot wait to make this! Hi Adrienne, I use green peas 🙂 Let me know how this turns out for you! Is it possible to substitute almond milk for the coconut milk? I have a problem with coconut. Can I use almond milk or hemp milk and just add some fat to it? I made these last night stuffed with onion, cauliflower and sweet potato with the green chutney – they were amazing. I need to make some for a party and am hoping I can prepare the night before, refrigerate and bake before the party. Anyone done this? What are other good potato substitutes for the filling? You’re a friggin’ genius! I forgot that you’d made these. I am new to this gluten-free, paleo thing and frankly, I’m a cooking newbie. But luv samosas and Indian food in general. My samosa pastry didn’t turn out as flakey as I expected but now that I look at the photo again, mine look ‘somewhat’ similar. The filling is awesome though which makes up for any screw ups with the pastry batter 😉 Will definitely make this again. 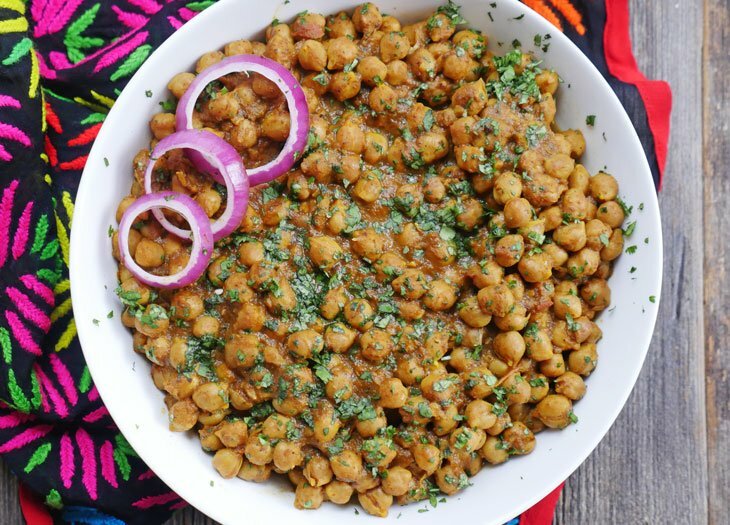 Thanks for sharing the samosa recipe – I replaced the ghee with coconut oil and it worked fine. I just love this kind of cooking. i have tried this recipes. Your naan, roti, butter chicken cookies. All of them are amazing. Your naan and roti are always on my table. You added a lot to paleo with these tasty recipes. Am anxious to try more of your recipes since so far all have been real yummy. Thank you so much. If only there were more than 5 stars. This looks awesome ! Thanks! Brilliant! We eat somosas at so many events and especially on Christmas Day! Last year I didn’t prep well so I had to miss out but this year I can make them and join in with all of the family! Thank you for the recipe I’m looking forward to trying it! Can we make the samosas with Almond milk instead of Coconut milk? Ann, I’m so glad you liked these! !